From the second half of the seventeenth century, brass blazer buttons were produced in the City of London for military and civilian wear. Later, blazer buttons became popular for schools and clubs. Blazer buttons for golf and schools have been a primary focus of Bowler & Blake™, worldwide, for 25 years. Forward your logo to art@bowlerandblake.com for a FREE no obligation quote! Each button is cut from solid brass or copper and is individually die-stamped in the traditional way. It is then buffed by hand in preparation for plating, as appropriate, in either gold, silver, antique silver or bronze finishes. Many of our buttons also feature enamel detail in one, two or three colors. Each enameling is applied one at a time using a fine paintbrush, before the button is carefully inspected and the raised detail is burnished by hand. 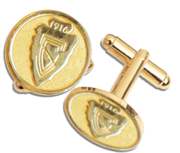 Cufflinks are a great add-on and are made from your small blazer button. Every set comes packed in our exclusive display box.